OpenLiteSpeed is an open source HTTP server developed by LiteSpeed Technologies. OpenLiteSpeed is a high performance and lightweight HTTP server which comes with a Web Gui administration interface. It can handle more than hundred thousand concurrent connections with low resource usage (CPU and RAM). OpenLiteSpeed supports many OS like Linux, Mac OS, FreeBSD, and SunOS and can be used to run website scripts written in PHP, Ruby Perl, and java. PHP 7 is the latest PHP version and privides better performance and has a lower memory consumption than PHP 5.6. It's the ultimate choice for a PHP developer today. In this tutorial, I will guide you trough the installation and configuration of openLiteSpeed and PHP 7 on CentOS 7. 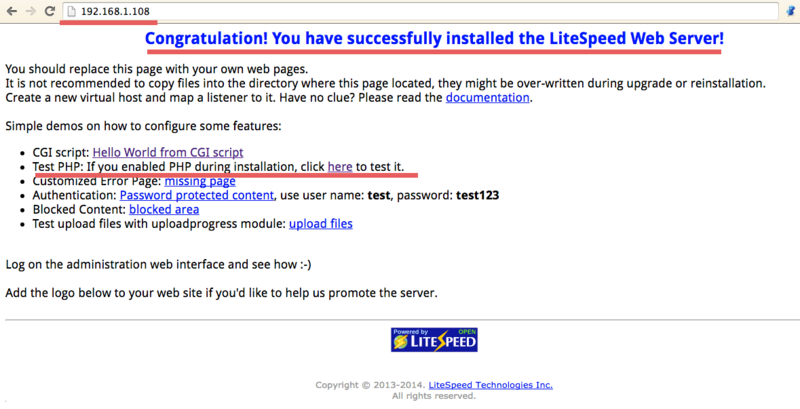 In this step, we will install openLiteSpeed 1.4. This is the stable version with many features like Pagespeed, file upload, PHP 7 support, RCS integration and HTTP/2 support. 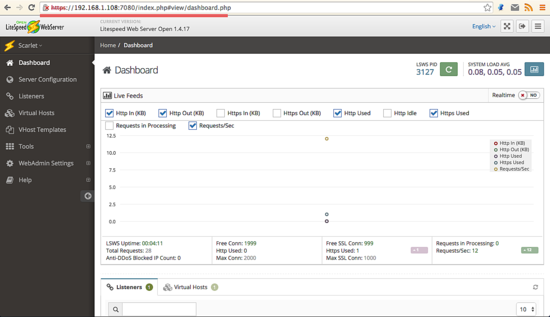 In this step, we will configure openLiteSpeed and PHP 7. OpenLiteSpeed has an Admin Gui for management, so we will configure the admin password for the openLiteSpeed GUI, and then configure PHP 7 to work with openLiteSpeed and open standard HTTP port 80. Type in the user and password for your GUI management. Next, open your web browser and visit the server IP address with port 7080. 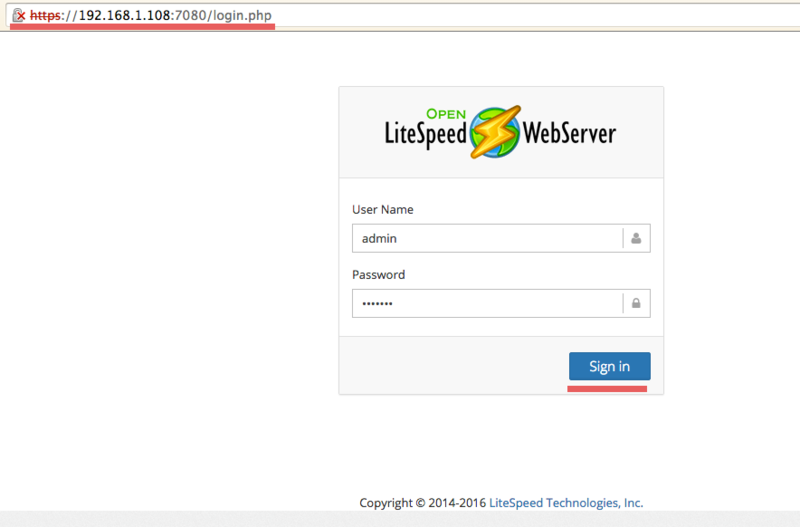 Type in your username and password and press "sign in" to login and you will see the openLiteSpeed dashboard. By default, openLiteSpeed 1.4 uses PHP 5, in this step, we will change it to PHP 7. Php 7 is installed on the server and we just need to add a new configuration through the management GUI in the browser. Click on "Server Configuration" and then on the tab "External App". 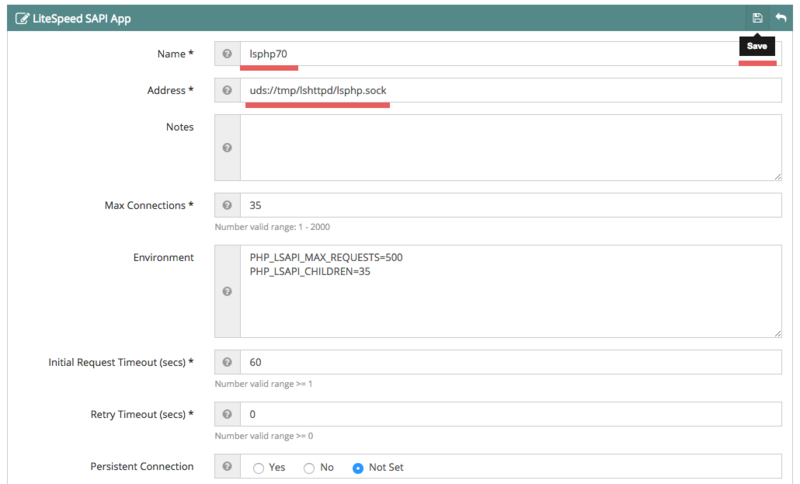 You will see "lsphp5" there with a socket address. 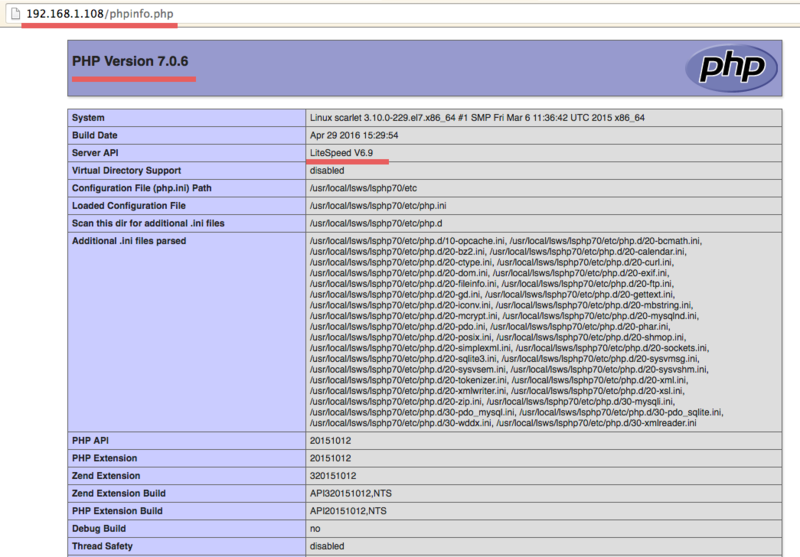 Add new "lsphp70" by clicking "Add" button on the right side. Click on the save icon to save the configuration. Then go to the tab "Script Handler" and edit the "lsphp5" 5 script handler. Change the handler name to "lsphp70". The default http port for openLiteSpeed is 8080, it's used to receive the client requests. In this step, we will change the port to 80 from the openLiteSpeed management GUI. On the left side, go to the "Listeners" section to see the listeners configuration. You will see the default listeners with port 8080. Click "view" zoom icon to see details configuration. Now click "Edit". Change the port to 80 and save the configuration. If all is done, restart openLiteSpeed by clicking on the restart button and click yes to confirm. Now we can test the server. Visit the server IP address with port 80 to ensure our configuration is working properly. 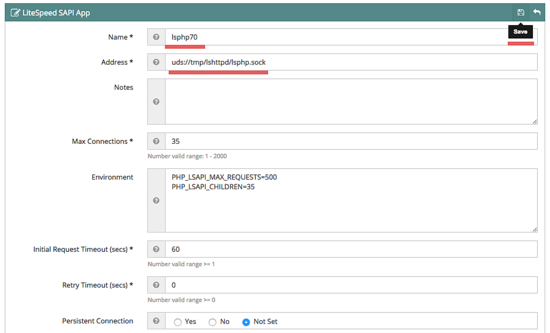 To test the PHP configuration, click on PHP info. Done and all working properly. This step is optional but I recomended it to change default port of Admin GUI for openLiteSpeed. To change default admin port configuration, click on "WebAdmin Settings" and then "Listeners", now click on the action to edit the default port. Click on the icon "edit" and enter a port for your admin configuration, then click "Save" icon. 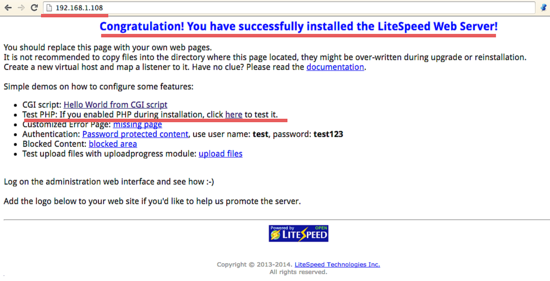 Next, reload openLiteSpeed from your browser and check the web admin. OpenLiteSpeed is an open-source HTTP server for Linux, Windows Mac, and BSD developed by LiteSpeed. OpenLiteSpeed uses a different PHP version, its name is "lsphp" and there is support for lsphp7 or PHP 7. OpenLiteSpeed is easy to configure trough its admin GUI so we can configure it from a browser. Great tutorial. Everything worked smoothly without any issues. Very good guide. Everything worked from beginning to end. Currently setting up for prod environment. Thanks! hello Is this server more efficient than apache 2 ? How to install, configure Openlitespeed to work with multiple versions of PHP. For example, 5.6 and 7?